Malwarebytes Anti-Malware is a very effective tool in combating malware and other harmful programs. Free version of this program is sufficient to scan your computer and remove threats like trojans, viruses, malware, spyware, rogue program, and more. However, if you want complete protection, we suggest exerting a little budget for the paid version of Malwarebytes Anti-Malware. This software was built to be user-friendly. You can easily navigate to various features of Malwarebytes Anti-Malware via the tabbed interface. It also allows you to choose three types of scanning process namely Threat Scan, Custom Scan, and Hyper Scan. Obviously you will run Threat Scan when something is not usual on the computer. Hyper Scan consumes less time and is advisable to run for maintenance period. Custom Scanning allows you to customize where and what you want to check. Scanning the computer with Malwarebytes Anti-Malware is pretty simple. It doesn’t require professional or technical skills to remove malware using this software. Just straight scan and remove button are needed to click in order to fix malware infection. 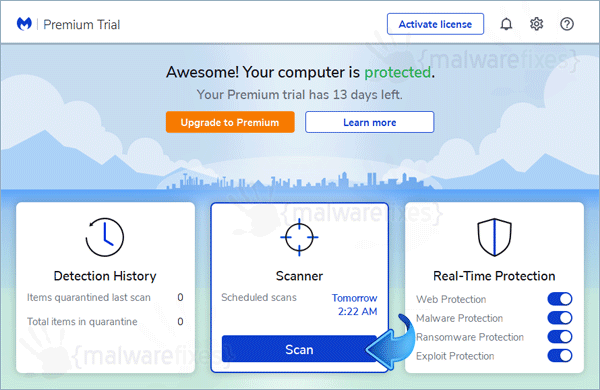 For advanced users, Malwarebytes Anti-Malware provide settings page in which they can configure which object to scan and what the software does when Windows starts. Heuristic engine is also one part of the software that increases malware detection efficiency to remove suspicious items from the computer. 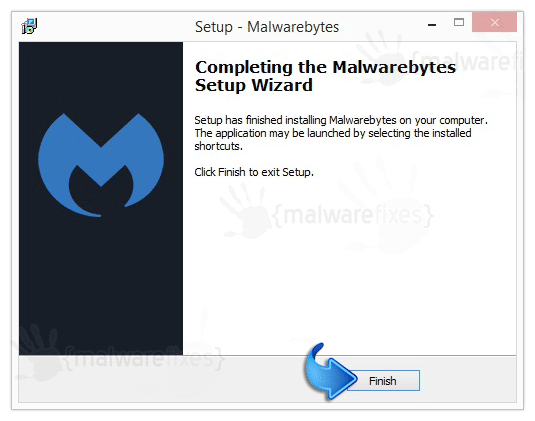 How to Download, Install, and Scan with Malwarebytes Anti-Malware? 4. On the welcome screen, click Next to proceed. 5. Next window is about License Agreement, you must accept this and click the Next button. 6. Proceed with the succeeding prompts until you reach the window Ready to Install. Click on Install button. 7. Installation process will take less than a minute. Click on Finish to run the program. 8. When Malwarebytes Anti-Malware interface appears, please select Scan from the side menu. Then, choose Threat Scan as shown in the image below. Click on Start Scan button to begin the process. The program will check for any available update before proceeding. Do not skip this step. Virus scan may take a while, please wait for the process to finish. When I click on the MBAM downware link, all I get is a blank window with “About:Blank” in the banner. What gives ?? I did have it before but deleted it before the company i had to go to for a computer restore on my system and now i am just now getting my computer back to par.. and i went and downloaded this and all then it says my upgrade is no one available HUH how is that? I paid for it and everything i am suppose to have a year’s worth of it.. Even if i deleted it off my computer as i wrote you guys before i did so and that is what you told me to do, so i did and now that i got my computer back and downloaded it again it is telling me i have to upgrade it again.. I can not afford to do it again.. i should already have this one.. What heck is going on.. ? Please can you fix this ASAP? thanks for your time. Dude, you just have to fill in your serialnumber, which you got during purchase, again. Then it will work as the full version. PUP.Optional.InstallCore is as potentially unwanted program installed on my notebook! Can I remove BWplayer? Ad spyware use this software.